When one door closes, another opens," said Alexander Graham Bell. When Kespa closed the door on professional BW, the door opened for the the amateur scene that held up StarCraft before many ex-pros returned. They were the few who still clung to the game and distinguished themselves for their skills despite their inexperience; all for the love of the game. They are a reminder of StarCraft's timeless gameplay and a small hope that in some way or another the StarCraft scene will continue for years to come. Climbing to the top of such stiff competition, there comes a player that has distinguished himself by his accolades as well as his rebellious playstyle. He declares from the mountaintops that there are no ex-pros he cannot beat, even Flash himself, and no limitations to using his edgy all-in playstyle. His very achievements of winning the OGN Game Festival, various online tournaments, and qualifying for ASL6 are testament to that fact. He is a lone soldier in a field dominated by standard and macro playstyles. He is ZeLot, top amateur Zerg. Thank you for doing this interview. To begin, please introduce yourself to the readers of Team Liquid. I often visit Team Liquid. I’m very glad to do this interview for our readers on Team Liquid. I’m ZeLoT and I’m known for being THE amateur Zerg player. I think I came to recognition by using a variety of untouched strategies and defeating ex-pros. I feel like I’m most known for my aggressive playstyle. Right, I learned a lot from you too ☺ You regularly stream your StarCraft gameplay on Afreeca. What should a person like to enjoy your stream? I think the people who are tired of watching the same, long and boring cliché macro games might find my stream more exciting and refreshing. Do you think foreign viewers can enjoy your stream as well? My English is not perfect, but I do try my best to greet all viewers nonetheless. Please come watch my stream and say hello! How did you come up with the name ZeLot? Well actually, it was the name that my close friend used when we were in middle school. Back then I couldn’t even defeat him once. I then joined a clan later in which I was asked to come up with a name. I couldn’t think of one and just used the name as my alias, with which I happened to be known as increasingly. So here I am, known as ZeLoT, haha. Then do you like your current name? And what clan was it? I wasn’t that good back in the days, so I couldn’t really get into “prestigious clans” [Koreans used to call popular, strong clans as 명문 클랜, as in how Ivy League schools or top schools are called “prestigious”]. The clan I got into was “Sin”, which is not at all known. It was on Brain server [A private server like Fish or iCCup, with their own ladder system]. As to the name ZeLot, there’s no one with the same name, and if you look up the name I am the first thing that pops up, so I think it’s a good name. Right, I remember back then people used to stay in the clan channel for 10 months or so just to get into good clans. So when did you start playing StarCraft and how did you first get into the game? I think my very first contact with StarCraft was when I was in 2nd or 3rd grade [around 7 to 8 international age; 9 to 10 in Korean age]. We had a computer guy coming over to help us install the desktop, and he installed the StarCraft without Battle.net. So I played that for about 3 to 4 years on single player with cheat codes like “show me the money”. Then I learned about BNet and I got completely hooked around 8th grade, and have been playing since. Damn, that’s exactly how I remember my experience too. May I ask how old you are? I’m 27 in Korean age, born in 1993. Wow, so we happened to be on B.net around the same time. Do you remember who was the most famous player back then? ...Let’s move on. What is your fondest memory playing StarCraft? Defeating Effort 2-1 in the Seoul Qualifiers for Vant Star League (the former name for ASL) is I guess most memorable for me. I won the two games in a row after losing to him first, so I think that was the fondest and the most exciting memory I have playing StarCraft. Can we safely assume that you’re the best amateur zerg? Well, career-wise, I do have a fancy career and people often call me the best amateur zerg. I, however, don’t agree with such adulation and I feel like Soma is the best amateur zerg. How very modest of you. I personally feel like you two have vastly different styles and there’s no point in saying who’s better. When and how did you become good enough to compete successfully in the amateur scene? Hm, I don’t think there was a “moment” per se, but I have been and am in the process of improving. I think the first time I became “known” was when I made it to Ro8 at the 8th Sonic Star League; it was the first time for any amateur to make it so far in a tourney with professionals. Ah, yet another name that we cannot mention. In retrospect, there was a lot of issues with the Brood War scene. On the one hand I’m thankful that the scene still carries on, but on the other hand, it makes me feel anxious about the continuity of the scene. How do you feel? Well, I had been in a bit of a drama myself before, and I think the scene is doing just fine. Wait, really? You had? May I ask for a more detailed account? Hm...well okay. It was before Stork announced that he will be streaming on Afreeca. I played against him on ladder a couple of times before he publicized his ladder account. There was a Protoss player named SBG who claimed to be an ex-pro, but he kept losing to me. So in order to spice things up for my stream, I made a couple of provocative comments towards that person who later turned out to be Stork. After SBG’s identity was unveiled, a lot of people [criticized] my behavior. Well, it was my fault. I did apologize to Stork, and Stork also accepted my apology; so it wasn’t that much of a drama, more like a mere happening. I see. You once said in an interview that you play an all-in style because you naturally win more. Were there any specific players or games you saw where you first learned the style or your signature builds? Oh, I don’t think you’ll like my answer. The answer is no. Most builds I use are not inspired by someone else, but are byproducts of my experiments and practices. I like trying different things and trying to polish the details of the builds [a process known to Koreans as “optimizing”]. So I take personal pride in my builds and my playstyle, in particular the fact that an amateur player can examine one’s build carefully enough to defeat professionals. Most deservedly so. The more you know about StarCraft the better you understand how difficult that is. So, how exactly do you optimize your strategies? Uhm, I simply grind games on ladder, trying different variations of the same build. To put it simply, just using the build under different scenarios and adjusting the details of the build according to the specific scenarios. I’ve been doing that for 15 years now, and I think that’s how I optimize my builds. When people hear the name ZeLot, they immediately associate the name with edgy all-in builds or aggressive playstyle. And even though your style is predictable, you still win against high-level players and even in tournament settings. How do you manage to beat them even when they are aware that something is coming? Well it's a complex amalgam of different elements. First, I do have my own algorithm. I do not preconceive a build before the game starts, but I use different builds depending on spawn locations, scouting, and my opponent’s opening builds. In short, I try to draw a bigger picture of the game where I can minimize the probability of losing. Also, I am very confident with my micro, especially with a small amounts of units. That enables me to make my builds successful even when my opponents know that something’s coming. Yeah, I beat him like 6 times and lost more than 50. Every game that I won against him are on my YouTube channel. Please come watch it! Wow, how did you feel about your victory against literally the best Brood War player in the entire universe? Needlessly to say, it [excites] me! Like, a lot. One of the things that I don’t want to hear when it comes to StarCraft is that “all-ins have inherent limitations”, and if I can make it work against FlaSh, though my successes may be small in number, I still believe that I’ve proved that there’s no such limitation as people describe. Yeah. In ASL 7, what were you planning when you did a bizarre center 10-Hatch build versus Best? Well, I’ve played a lot of ZvPs on Block Chain, and found out that playing against Protosses that build 1 Gateway in the main followed by island expansion into Reavers was very very difficult. I didn’t think I could counter that playstyle with the builds that I used to use, so I thought I’d try something different. That strategy actually counters 1 Gateway playstyles pretty well, and still has a chance against Forge Fast Expansion, so I thought it was a great strategy. I had not even imagined that Best would go 2 gateways on that map. I was very confident with that strategy because I never lost a single game on practice games. But Khm…I still can’t watch the VoD. We, as in foreign viewers, were very excited to see such an attempt. Still, you won an amateur tournament that OGN held just before the FlaSh vs Jaedong showmatch! So it all worked out just fine. Could you describe what your experience playing in it was like as you advanced through the bracket? Oh, you know about that? Lol! Well, first of all, the tournament took place in some city that was too far from where I live, and the games started in the morning. So I had to go to the city the day before, find a place to sleep, and then participate in the tourney, which [prevented] me from practicing. But in the end I thought I’d regret not playing in the tourney so I just went there anyways. I faced a lot of difficulties from the qualifier rounds because there were a lot of strong players. I think I only made it to the finals because I simply had more offline tourney experiences. When in the finals—to be completely honest—I wasn’t nervous or anything, but I was sleepy. My sleep schedule didn’t align at all with the tournament’s schedule, and I was simply too tired and sleepy to be nervous. I also didn’t really think that I’d lose to my opponent. I guess that’s why it worked out well. Well, it was my first time winning an offline tournament, and it felt fancy to play in a booth. I’m very happy that I can add this one line to my StarCraft career. I’m glad to hear that. What competition is usually available to amateurs outside of ASL/KSL qualifiers? Tourneys specifically designed for amateurs are practically nonexistent. Even when we have such events, the prize pool is very limited. The tourney I won was not actually an amateur tournament but a part of the game festival event. So I don’t think there are a lot of opportunities for amateurs; but of course, I do wish there were more. Are there any future events you are going to play in or plans you have in general? I used to work until December 2018, and only started to stream full-time since this January. I’m planning to participate in virtually everything I can. What was the job that you surrendered? I taught mathematics at a private institute. Uhm, well, err, I guess, compared to other subjects. Well, there’s that. And to give you a more serious answer, I’ve been playing foreign players for quite some time now, and a few years ago the discrepancy in skillsets between Koreans and foreigners was huuuge. I mean it is still now, but the gap has been closing and the understanding/execution of the build order and micro of the foreign players has improved greatly. I still think there’s a lot to catch up for foreigners compared to Korean players though. Fun fact: I was 2300 MMR in EU ladder but now I’m 1700 MMR in KR ladder. NA is worse, though! Jokes aside though, Korean players do seem stronger on average, especially on higher skill levels. How did you first join SouL clan? And What has your experience been like? There was a player named “Ultra” who tried to join my Korean clan, Sarin. I helped him join the clan and “Ultra” introduced me to Fujikura, which led me to play for SouL. To be perfectly honest, I don’t think there’s much of an “experience” per se, because I feel like I only have the clan tag on and don’t really interact that much with the members. Nonetheless, I’d like to use this opportunity to express my gratitude to Fujikura, who’s been helping me in every aspect regarding participating the foreign tournaments, having friendly conversations with SouL members, broadening my horizons, etc. Thanks, Fujikura! Do you maybe experience language barriers? I don’t think language barrier is the issue; as I can speak and understand basic English. Fujikura and Ty2 did tell me that your English is great. How is the streamer lifestyle working out for you? What are some of the challenges you’ve faced? I’m sure a lot of foreign fans are curious as to how streamers make their living or what kind of lifestyles they lead. Nonetheless, I’m satisfied with my lifestyle now. I’m just hoping to get some more star balloons haha. Can we ask you to tell us a little bit more about your stream? I don’t think I stream with a fixed schedule as of now, but I can tell you that I mostly stream around daytime and after midnight. Late afternoon to evenings are governed by major streamers, and there are a lot of big events going on around that time so I don’t get a lot of viewership then. I think what differentiates my stream from other streamers is my communicative prowess. I read almost every chat message that comes up, and I try to answer them or have a sincere and genuine interaction with my viewers. Even if you don’t speak Korean, I can still speak a little English and whatnot; so please come watch my stream! Thank you very much for the interview. I’ve enjoyed it a lot. Do you have anything else to say for the readers? Oh, I think I should talk about my YouTube more than my Afreeca. I have less than a thousand subscribers and I’m not making any money out of it ☹. Here’s the link to my Youtube channel. I have 790 subscribers at this moment and I’m looking forward to having more than a thousand! I don’t know when this interview will be published, but let’s hope that you’ll get that remaining 210! Yeah! The number of subscribers has been stagnant for some reason for a while now. Well, to my foreign fans: If you have already watched my games you’d probably know that I use a lot of different and at times bold strategies to defeat professional gamers and amateurs alike! I’d like to formally invite you to my YouTube channel and Afreeca stream, and please subscribe if you’d like! Awesome! Thank you very much for the interview. It was much better than CadenZie’s. Well, there’s that. I really enjoyed my time with CadenZie and hope to share such experience once more in the near future! Right on! I’ll make sure that your message reaches her via the interview! Again, thank you very much for doing this! Hope to see your edgy plays again on major tournaments in the near future! What is his youtube link? I really gotta check it out looks entertaining. Doh it is above I just read it. @[AS]Rattus It is kind of confusing. It’s juat a small tease from the interviewer who is friendly w/ cadenzie and I guess a way to bring her up since cadenzie mentioning zelot lead to this interview. Zelot had quite a few things to say too! 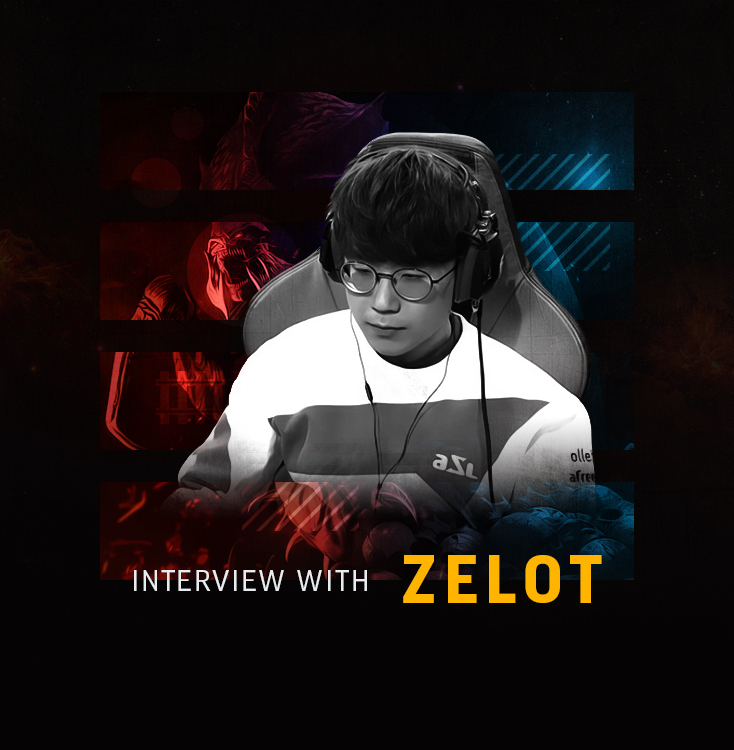 Thank you for this interview, cheer to zelot (as much as it pains my Protoss soul to say so). sound like a great guy. Good luck with your BW career. Will be rooting and watching you in future events. This is absolutely fascinating. Basically his theory is that allins can be successful against anyone, even if they know they are coming. If he gets better, it could be a fundamental paradigm shift for starcraft. All hail our God bleeder! His last videos on channel are how he owned FlaSh. In other hand I'm against for only practicing all-ins and pretend they will work somehow with luck percentage. He needs to improve all other aspect too if he really wants to become an accomplished amateur. All-ins are only good couple times in bo5 not 24/7 because you'll be so predictable. all the other amateurs are not doing any better result wise though... in the end without dedicated professional teamhouse training an amateur can never reach or surpass the level of any kespa expro. zelot is aware of this which one of the reason why he opt to go for this hyperaggressive playstyle despite the fact that he has the mechanical ability to learn and do standard play as well. so this guy is the new jaedong? How so, my friend? Where is the comparison? Was not the dominant JD known for his amazing prowess and ruthless decisiveness both in aggressive plays as well as for his immaculate macro orchestration? I mean, Zelot is doubtless a fresh and most welcome addition the the streamers and is an exciting player in his own right yet I can not see even a slight resemblance between him and in form JD. This is indeed my opinion and I might be totally wrong.